Money - only coins. 1p and 2p 'copper' coins work best. Small cups or jars - NOT metal. Glass is best. Nowadays most people know that soaking things in cola can clean them. 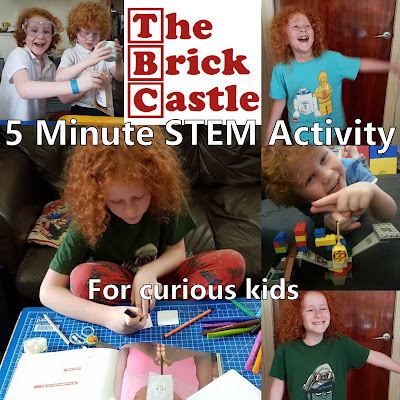 Pennies, kitchen worktops, car engines and all kinds of solid materials. 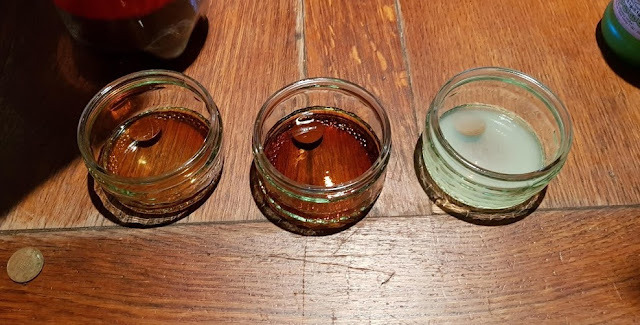 The acids in the cola, added to the fizzy effect of the carbon dioxide (and possibly the secret ingredients), dissolve the grease and lift the dirt from the surface and allow you to wipe it away. In this experiment we are going to clean pennies, We are using cola, lemon juice and vinegar, which are all acids, but you can try different liquids too - ketchup, lemonade, orange juice and brown sauce are acids you might have in your house. 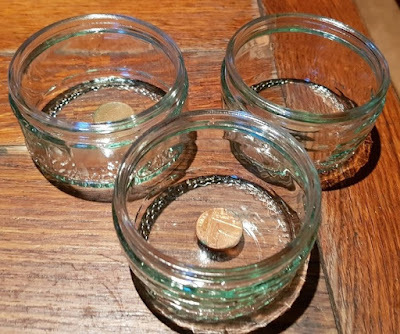 If you want to have a 'control' penny, then you can put one in plain water to compare at the end. 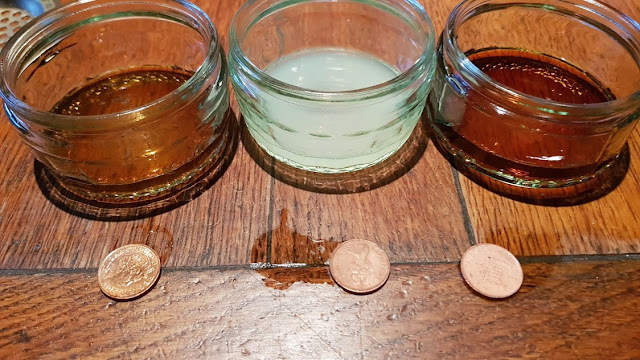 Which substance you think will clean your pennies best? Write down your guess. 1. 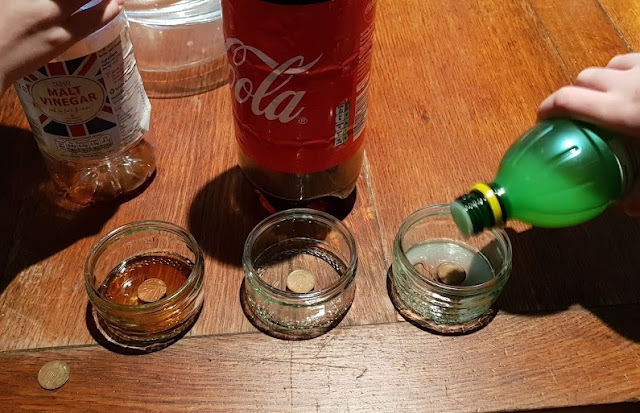 Add a single penny to each cup or glass and then add around 1cm of liquid. Just enough to cover the penny. Add a different liquid to each. 2. Leave it to soak for a whole 24 hours (1 day). What are your results after 1 day, 2 days, 1 week? What substance cleaned your pennies best? Which substance made them the shiniest? 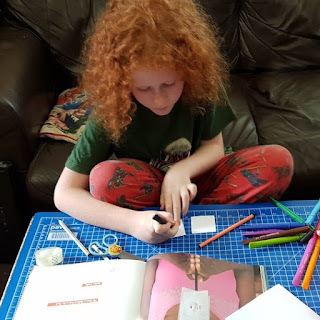 Humans don't clean ourselves or our clothes using acids, we clean ourselves with alkali - soap. 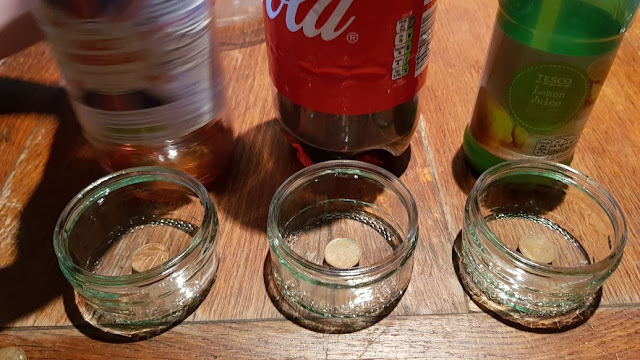 You can also try cleaning your pennies using an alkali, such as bicarbonate of soda and water. Will this clean your penny? Did you know that a strong alkali can burn you in just the same way as a strong acid? This is why you should always wash your hands after touching laundry powders and liquids. (There's a list with all the links at the bottom).